Bishwa Ijtema Bangladesh-2012 first shift begin at 13th January side of Tongi Turag river.It was the Tablighi Jamaat 46th Bishwa Ijtema which began after the Jumma Namaj (prayer).It was the second time when the Bishwa Ijtema Bangladesh hold on two phases.Second session of Bishwa Ijtema started 20 and ended 22 January 2012. Tablighi Jamaat Ijtema revived by Muhammad Ilyas by movement in 1927 at Saharanpur of Uttar Pradesh, India. In course of time, Ijtema association extend throughout the subcontinent of the area and also influenced other regions of the world. 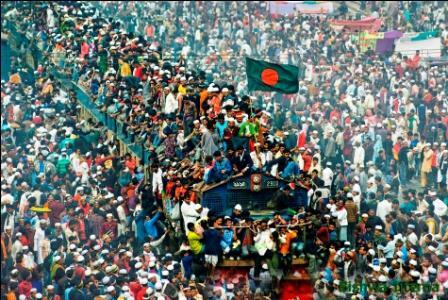 After the partition of Bengal in 1947, three Ijtema centers developed in three parts of the subcontinent–Bangladesh, India and West Pakistan.However in terms of admired presence, the Tongi Ijtema is the largest of all these congregations. Millions of people gather in Bishwa Ijtema from different country of the world.During the period of Ijtema many famous moulana deliver the sermon (Bayan) about the Islamic life according to the Quran and Hadith.They come from various country such as India,Pakistan and other muslim country.Now Listen the Bishwa Ijtema-2012 Bayan.